So I now have a plan. Yeahhh! Every week Dave is sending me a list of what I need to get done each day. It's great, as I log it in my diary and then just go out and do it. Well that's the plan anyway. 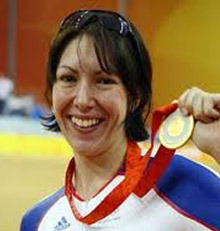 This week was interesting as I met Rebecca Romero who is a brilliant Olympian, not only in cycling but also in Rowing. She said getting fitter is easy as you've just got to go out and do it. I have always found the hardest element is getting your kit on, getting your bike ready and warming up. Once out, you get into the groove so to speak.